With the several websites emerging in the net, it is often a struggle to find high quality resources that will make your websites stand out and be completely unique. Although, it pays to create your own designs to cater to this need, it is often impractical to do so because of time and resources constraints. Some designers, then, turns to free resources that are already available in the internet. This includes PSD files of web badges, web backgrounds , tags, and search boxes. In this next post, we have came up with another collection of useful resources that you can use for your designs or websites. This Ultimate Collection of Free Buttons in PSD Format is a compilation of high quality buttons that you may find useful and unique. Also, since the files are in PSD format, you may add a few of your personal touch to make more. As we want our readers to get the freshest resources out there as much as possible, we have updated this post and added more buttons that can be downloaded for free as PSD formats. Scroll down and check them all out. Come, take a peek, and choose your pick. And as always, Enjoy browsing! 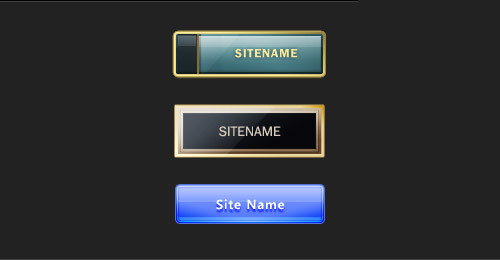 This first freebie in the list encloses five black-themed buttons that are uniquely designed from each other. Each of the buttons is in their own PSD file to help avoid confusion from layers. This button pack includes three power buttons that were designed to look slick and futuristic. They come in color variations of white, blue, and green. This pack also has additional 3 small “start engine” buttons for free. 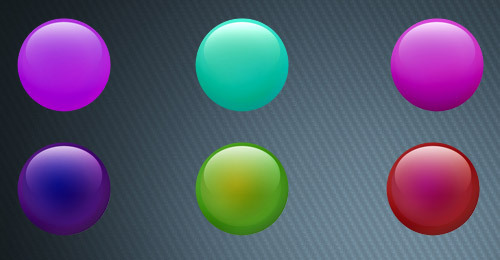 This is a single green button freebie PSD format. It utilizes a glossy look with additional drop shadow and reflection effect. By the way! Be sure to also check out this useful PSD collection that can boost your design and website. This next freebie pack includes a collection of 16 PSD files of various buttons for dock bars and a PSD file that contains the templates, which were used to make these buttons. These were made in Photoshop CS3. 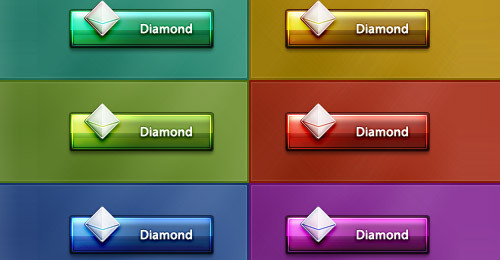 This pack includes six color-filled buttons that utilizes diamond element as well as a glossy look. The button comes in 6 color variations of blue, gold, green, purple, red, and teal. Each buttons have its own PSD file to edit. Generic Pair contains two freebies: a rocky-textured gray button in 187x64px size and a black button energized with a glow effect. Both of these are available in their respective PSD files and can only be used for personal designs. For this next pack, you get a PSD freebie that contains 7 buttons of frog, reggae, banana, checkered, Windows, heart, and Apple. In addition, Lemex also generously added a ‘blank’ button where you can put your logo, text, or anything you want in it. This PSD file was made in Photoshop CS2 and holds 5 button designs. The pack includes a textured carbon button, black, light blue, light gray, and Dark gray. All of these buttons are in 235x59px. Here we have a highly detailed blue button with arrow element in 358x368px. The details created by easydisplayname are impressive; including the metal texture on the rim, the glossy lightings, and more. This next PSD file contains eight blank with a dimension of 125×125 pixels. It is available in different color variations: purple, blue, carbon gray, gray, orange, red, yellow, and green. They are all customizable but are only limited to personal use. In this next freebie, you have two dark button designs with their respective PSD files. These buttons are in 101x38px dimensions and can be edited and used for any personal designs. Here is a pack of 125x125px square buttons that are applied with many enhancing effects such as the glossy effect, drop shadows, and reflections. All these effects are preserved in vector masks and layer styles so it is easier for you to edit the sizes, colors, and effects; all according to how you’d like them to look like. They can be used in any of your designs as long as you provide a link back to the page where you downloaded this pack. For this next one, you can add another set of these beautifully designed buttons to your designer resources. This pack includes 21 glossed buttons that are in 123x38px size. Each of these buttons has their own layers grouped and labeled for your easy editing. You can customize the colors by changing their gradient overlay and change the sizes as well – they are in vector masks so you can resize without damaging the quality. This is another pack for you can have for free. It includes a total of seven buttons: one transparent, three having color variations of black, red, and blue, and the other three with the glass effect for an extra gloss. Each of these buttons is approximately 182x48px and is preserved through vector masks. They can only be used for personal designs. Here is another freebie set that contains carbon-inspired buttons. There are two buttons in this set that are designed with carbon texture and additional shine effect for a slicker look. 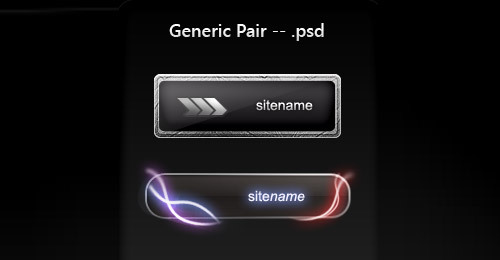 The PSD file includes the layers for the light frame and black frame versions of the button. Easydisplayname shares another beautiful set that contains four buttons in their unique designs. It includes a blue button with a glossy look, a green button with a light glow effect, purple button with a laminated style, and a yellow button with the beautiful sparkles. 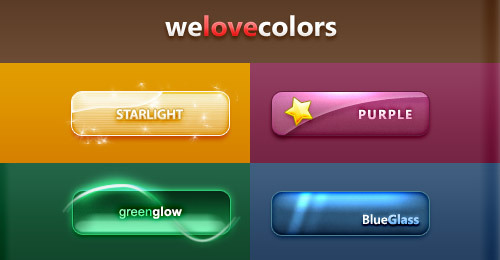 Each of these buttons has its own independent PSD file where you can edit its color, size, and other elements as well. You may only use them for personal projects. This next pack contains six buttons that are designed with a more simpler and cleaner look. These buttons are also separated with their own PSD files to lessen the confusion in managing the layers. The buttons are in 153x49px and its main shape is in vector mask for a more effective resizing. They are for personal use only. Another useful collection of buttons that is free to download in PSD format. This set will give you a nicely designed button with 3D and glossy effect. It also comes in 11 default color variations of blue, orange, violet, green, brown, and more. The layers of each button are already well organized in groups for you to have an easier navigation when editing. The buttons are 165x61px in dimension and its main shape is in vector for easy resizing. Discover 10 more buttons in this next pack where each are designed with different sizes, colors, and style. It includes gloss effect, minimal, capsular, paper, and a lot more. They are all in this one PSD file with the layers well labeled and organized. The main shapes of these buttons are also in vector that enables you to resize without significantly spoiling the quality. Get to have this 9 circle buttons made playful and sweet (they look like candies) in PSD file. Freely use this next pack for your design. It basically contains two call-to-action buttons that have different designs and each having one other variation, having a total of 4 buttons. The blue and orange buttons are in approximately 226×48 pixels while the red and green “download now” buttons are in 237×45 pixels. This next freebie is available for personal designs only. It contains 3 buttons in their distinctive designs and sizes. The green button is in 154x49px, the blue button is 150x42px, and the black one is in 151x54px dimension. Do you want to create your own buttons? Then this next item will not only give you a button, it will also help you learn how to make one. This tutorial will also teach you how to use some CSS techniques that make your buttons interactive when the cursor hovers on it. If you’re looking for a set of buttons that you can use, then this pack is for you. It contains 15 clean buttons made more attractive with glossy designs and drop shadow effect. It varies in fifteen colors and easy to resize thanks to the vector shapes. You can also change the colors by editing the gradient overlay of the button. Here is another set of blank buttons that you can use for practicing. They come in 6 color variations of black, gray, blue, green, red, and yellow – all with the glossy effect. Downloading this pack will give you the 6 buttons in PNG, PSD, and UFO format. The size is in 256×256 if you use the PSD file. This next button freebie includes the design for when the mouse is hovering on it and when the button is clicked, perfect for developers who are using CSS animation for their buttons. The button has 130x30px dimension and is designed with a dark and glossy appearance. The download will also give you three various border styles to choose from. This next freebie is free to be used for personal and commercial projects. It contains three download buttons in colors red, blue, and black. The buttons come with various ‘download’ icons placed on the right side of each button for more visual stimulus. The PSD file also includes designs for different CSS states: normal, hover (when a cursor is on the button), and active (when the button is clicked). 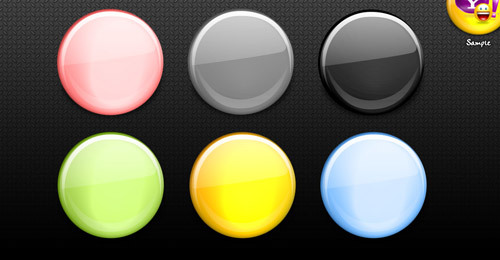 We have here a circular button that has 19 different color variations that you can choose from. The buttons are available in JPG format and PSD format as well for editing. They are all in 400x400px dimension and can only be used for non-commercial projects. Here we have a set of rectangular buttons that are in 199x56px dimension and comes in seven color variations (similar to the colors of the rainbow). These buttons are also for personal use only. In this next feature, you’ll get to learn and create how to make a construction-themed button in Photoshop. You’ll use various techniques such as gradient overlays, pattern overlays, and more. Another set of rectangular button with 151x47px size. It comes with a simple gradient design and has 6 color variations of dark blue, green, purple, red, teal, and yellow. If you are looking for a button for your fantasy design, then we have something you might want. This next item is a rectangular button that is designed for fantasy-themed websites and game applications. It is available for any design use and can be downloaded in PSD format. It also has a design for normal, hover, and active states. A pack that is filled with clean and useful share buttons, this collection will help you in your marketing by using these buttons in promoting your website, article, or product to social media platforms such as Facebook, Twitter, Google+, and Pinterset. Each of the buttons’ layers is well organized and grouped in PSD format for easy navigation and editing. This next item is a simple yet fun looking button that can be used for web design. It includes the button designs on, in between, and off state. The PSD file contains well-organized layers in groups and matched with colors. All the shapes are also in vector for easy resizing when needed. For web designers and developers, here is a set of rectangular web buttons with round edges. They are designed in having a modern and flat appearance and come in 6 different varieties of colors: red, green, white, black, light blue, and blue. They are downloadable in PSD format where you can adjust the sizes, colors, and other elements without decreasing the quality. In this next button pack, it includes a collection of app download buttons in PSD format. It includes 9 minimal white buttons and their colored counterpart, for a total of 18 buttons. Each buttons have their layers well organized in labeled groups. Also, all the shapes are in vector for easy resizing. This is a set of white minimal buttons for download, favs/likes, and share. They are all in PSD format where all the elements are in vector – meaning all the three buttons are resizable without losing the quality. The default size of the buttons from the box boarder is 100x90px and from the round border is 74x74px. Here is a cool set of beautiful set of seven buttons in a lovely rainbow color. In one PSD file, each button’s layers are well organized in a labeled group. The buttons are made from vector shapes and are in default (but resizable) 186x73px. A buttons for game controller, here you have 11 buttons that you can use for gaming-themed designs. For this set, you have a button that has ten variations of colors (gray, pink, blue, etc.). It is also designed with normal, hover, and active state – having a total of 30 button designs. Each of these buttons is in approximately 82x32px and every shape is in vector for you to have an easier time resizing the buttons. This big pack includes 15 flat buttons design with 5 different styles for a total of 75 buttons. All these buttons are completely made of vector shapes and fully customizable in Photoshop. The layers are nicely ordered in groups. Which of these free buttons in PSD format will you use for your next design? Did we miss anything? Feel free to add your comments and suggestions below. As an add-on, I have a PSD button set here as well. wow.. great one.. definitely the greatest!! This is what I call an ultimate collection.. Thanks for appreciating the collection guys :D. Any suggestions on the next PSD collections? 😀 . Thanks for posting these links, these are great! Ohmy. Great. I will use one of this sample on my own blog. Thanks, Ronald! Very handy collection of buttons! Thanks! Great Post Naldz……I especially liked the industrial button set…..really classy!!! How about a collection of online psd signatures????? Awesome set, I love this collection, this will come very handy indeed. Wonderful collection…. creativity has no boundaries N limits…Roland U Rocks budy..
Nice round up of freebees, very much appreciated! Thank you for adding my Twitter buttons! I greatly appreciate it. I am already impressed with the first set! Thanks! Will be extremely useful! WooW great collection!! Thanx so much! Great collection, ‘Sign Up Buttons’ are so beautiful, thanks! A very nice list. Good work. I like it. Excellent buttons dude. thanks for sharing. OMG! GREAT! Cool! Thank you very much for these buttons. Nice and Clean! love your work. Really good stuff. Thanks you very much Ronald! Great collection. Very useful web resource for web designer. it will help a lot to me, in designing my thesis…. A great collection comprising of actually buttons as well as many tutorial blogs! G’d one mate!! Really nice and colorful collection of buttons. Thanks for download facility. thanks alot.. for your all colorful collection this is really cool and great collection. Thanks for sharing this marvelous collection of web buttons. Wow, this is the best and awesome psd collections. I’ve ever seen so far. Wow, awesome set! Seriously love this. Will save me a lot of time. Thank you!